This past July, the WMU Graduate College and the Office of Faculty Development offered an exciting new opportunity for new and returning graduate teaching assistants — the “Graduate Student Teaching Institute,” a week-long, intensive training course designed to improve and expand students’ pedagogical skills. 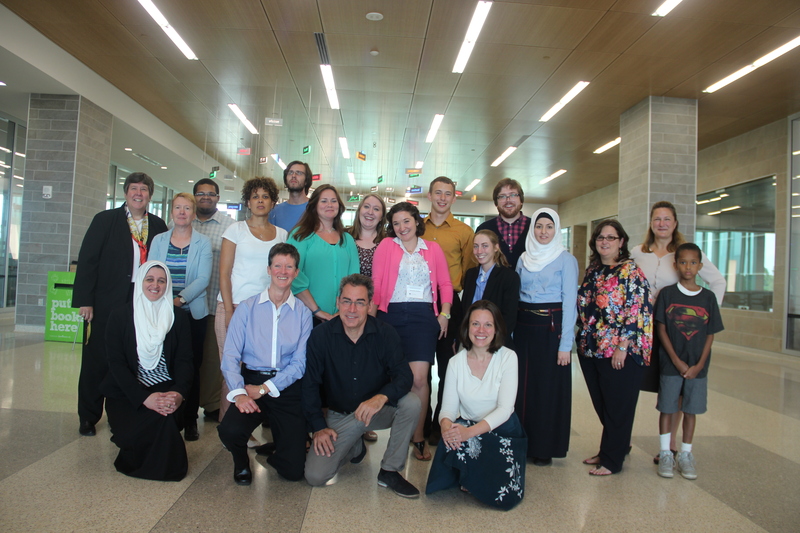 Over the course of the week, graduate teaching assistants from various disciplines and programs participated in group workshops on topics such as how to motivate students to learn, how to master active learning strategies, metacognition for student engagement, improving communication for diverse learners, and techniques for using technology in the classroom. Professor Suzan Ayers (HPHE), one of the co-directors and facilitators of the Institute, argues that this kind of training is invaluable to our TAs. “We expect graduate students to magically be able to teach, and give them classes with hundreds of undergrads. Our graduate students have specialized knowledge about their fields, but they might not know much about how to teach when they first arrive here,” she says. Both Shelby and Cody had high praise for two particular presentations: a workshop on metacognition and student engagement, offered by Andrea Beach (Director, Office of Faculty Development) and a presentation on the historical impact of Paul Robeson, by Paul Solomon (Professor, Frostic School of Art). Dr. Beach’s discussion made instructors think about how we coach and instruct our own students to study, to learn, and to apply — skills that instructors often take for granted. Mr. Solomon’s presentation focused attention on the importance of timing, structure, and order when you are planning to present information, as this can make the difference between a dry lecture and a moving narrative. Participants also had high praise for workshops on constructing handouts and syllabi, including a discussion of “first day of class practices,” in which facilitators suggested that instructors involve students in creating the syllabus, asking for class input in deciding the ground rules of the class. They also enjoyed Dr. Julie Apker’s (School of Communication and Graduate College Fellow) presentation, “Beyond the Classroom: Applying Teaching Skills to Broader Professional Goals,” a session particularly applicable for participants looking at the job market. All told, these kinds of workshops and small group discussions encouraged everyone to speak up and have an active, dynamic role in the Institute. While the Institute seems to have been a rousing success all around, Dr. Ayers adds that this is a kind of “beta test year” for the event. The Graduate College and OFD plan to make the GSTI an annual opportunity for graduate students across the university, with participants receiving a certificate of completion. Beyond this, the GSTI is only the first component in a new Graduate Student Teaching Credential program (co-facilitated by Drs. Ayers, Walter, and Paul Solomon). Plans for this credentialing opportunity include requiring completion of the five day Teaching Institute, consistent participation in a learning community across the academic year 2014-2015, and production of a professional portfolio synthesizing their experiences, not to mention a significantly broadened “toolkit” of pedagogical knowledge, experience, and a support network that they will take with them into future roles as teachers and faculty members. **The Office of Faculty Development continues to offer workshops, advising, and “Cool Tools” sessions intended to help graduate teaching assistants (and faculty) improve their teaching skills. Have a look at their website to see what’s coming up! This entry was posted in Uncategorized and tagged Faculty Development, Graduate College, Graduate Teaching Assistants, Pedagogy, Teaching.